It’s One Room Challenge update time!! Last week we talked about the Farrow & Ball Jasmine wallpaper I have fallen in love with. The pattern is soft and subtle and the taupe color is so warm and happy. I think it will be a great backdrop for poppy art and modern touches! This week we finished selecting furniture for the room. 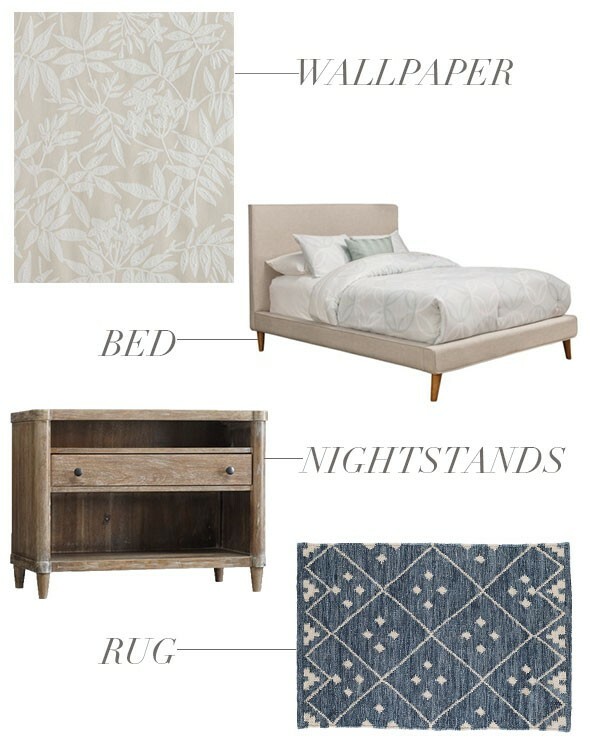 We found a simple, clean-lined upholstered bed from Hayneedle that I like a lot! I think it will be so pretty with the wallpaper and the blue Dash & Albert rug we’ve all been obsessed with here at the office. We ordered the 10×14 size which will be so cozy and soft! 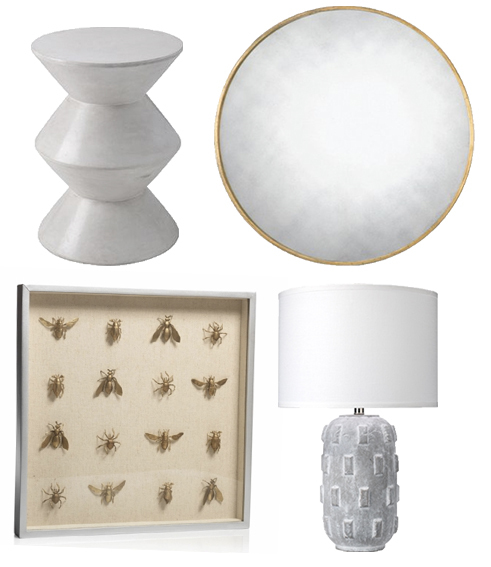 We picked out some of our key furniture pieces from The Mine including those beautiful nightstands as well as a bunch of accessories. The mirror is HUGE and will look great above our dresser, layered with art and that crazy cool lamp. We picked this GORGEOUS leather bench from Article for in front of the big window and this soft blue gray arm chair for a little reading nook in the corner of the bedroom. 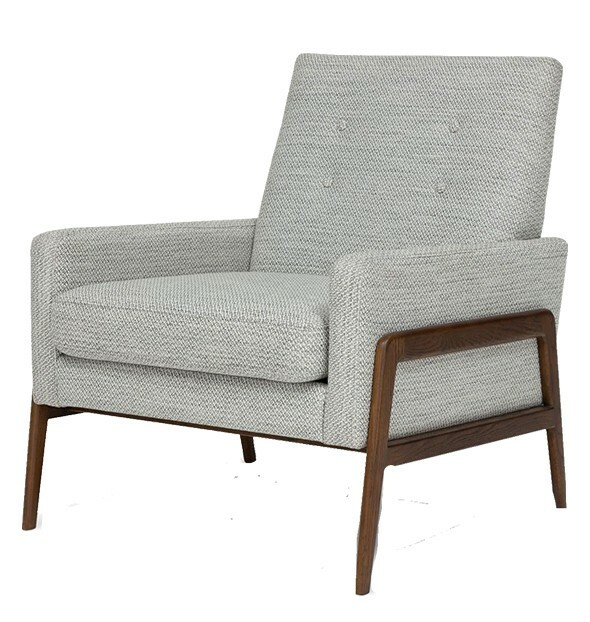 I love the detail on the leg detail on the side of the chair! I can’t wait to see these beauties in person! 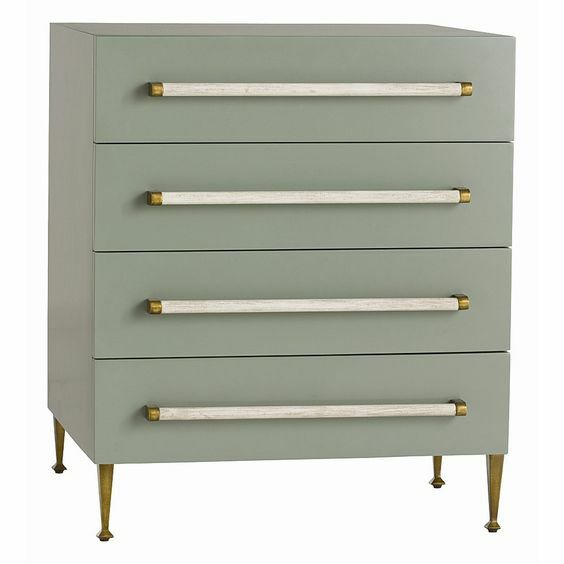 I’ve long been obsessed with this style of dresser from Arteriors. Those oversized dowel style pulls are just too perfect and that color of green-gray is my favorite shade, especially with that white and gold combo! I might regret making a formal announcement on this, but I think we’re going to try and DIY our own version of this dresser! 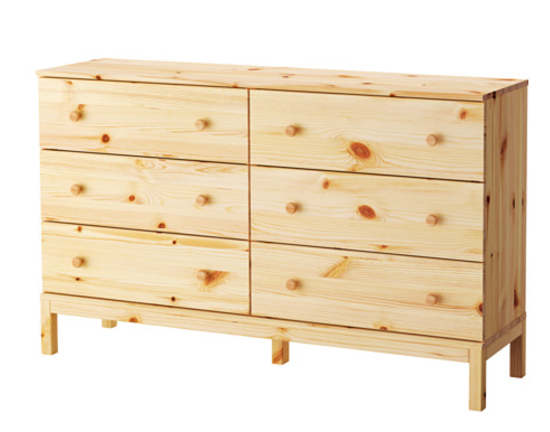 I picked up this unfinished dresser and we plan to use some t-connector pipes and dowels to create the handles. I’ll be sure to report on how this worked or didn’t work for us! Don’t forget to check in on the progress of the other ORC participants! This is going to be such a tranquil room. I love your DIY dresser idea and can’t wait to see how it turns out. If you do move forward with the ikea dresser be sure to mount it to the wall—there have been issues with kids easily pulling their dressers over. Looking forward to the reveal! House Seven Design made a barn door handle that might be similar to what you’re wanting to do for a pull on the dresser. Excited to see everything come together! Love everything except the insect art. Spiders in the bedroom?? No thank you!!!!! Make sure you seal those knots in the wood or they will come through! My best friend actually did a makeover with that IKEA dresser and the handles are made of copper piping. It turned out so cool! She got the idea from Pinterest so check there for a DIY. Oh, I just saw Linda already mentioned this! Beautiful dresser idea, looking forward to a successful DIY version. Too bad the Arteriors piece is no longer available, although I see Chelsea Textiles has similar, with a woven or rattan wrapped handle. New legs are probably not hard to find, but how do you propose passing PVC pipe as brass for the ends/fittings?? Super excited to see how the dresser comes out. I’ve been pining away for that Chelsea Textiles beauty for a while! I made long drawer pulls out of oak dowels and small L brackets, and they work surprisingly well. I stained the dowels black. They’ve held up to heavy drawers for about three years. We have used that same dresser. Just make sure you shellac the pine knots. Ours are starting to come through. Erin Spain just did a project on her blog and used really cool furniture legs that I had never seen at Home Depot before. Check it out! They could really change the IKEA look of this dresser! I’d do a copper pipe end on the ends of the dowel and then use some sort of a small spacer between the dowel and the dresser front to give it just a 1/4” spacing between the dresser front and the dowel. I think with your talent you’ll make this hack look amazing!